I’m finally back with a nail post! It’s been a while since I played with my nails and I decided to expand my horizons a little bit. At the same time, I get to swatch two of my newest polishes. I decided to try doing different finishes (glossy and matte) and at the same time do an accent nail. This will be the first time I tried both techniques. 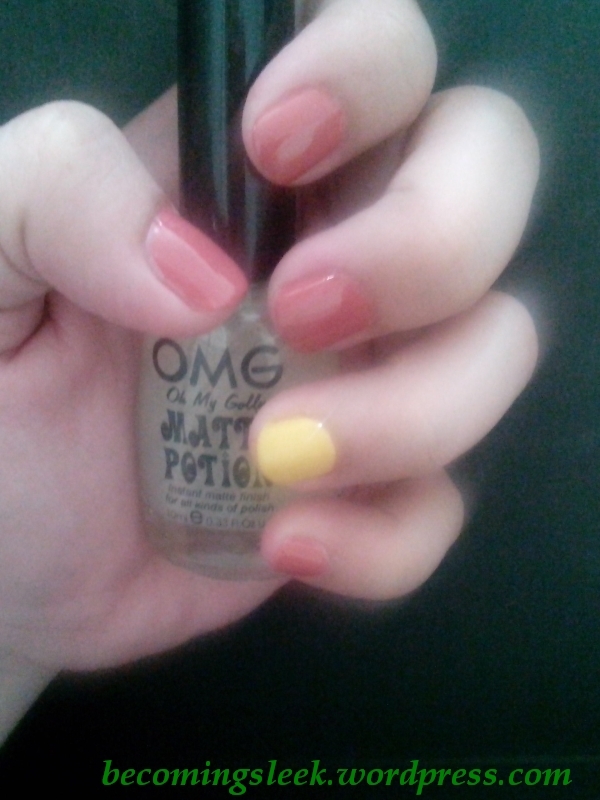 The two new polishes I tried here are Caronia Carolina Peach and Color Trends Sherbet Mango Yellow. 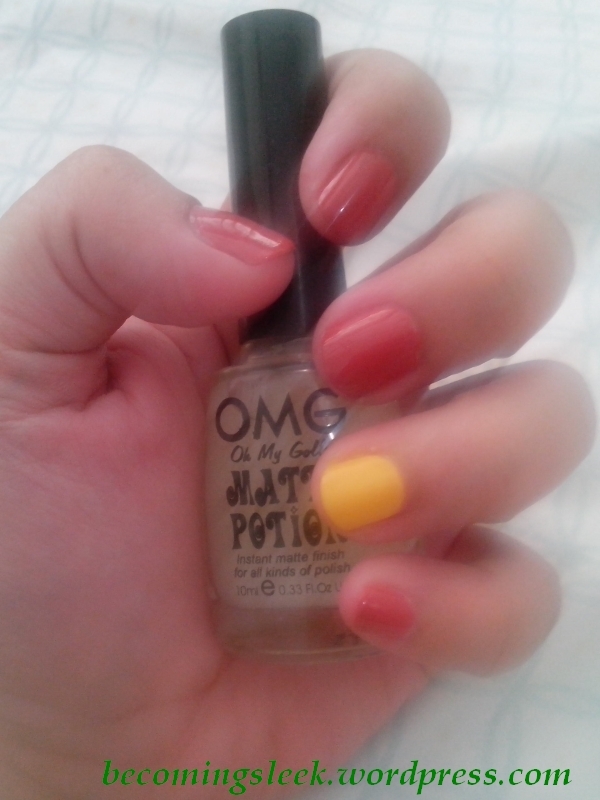 The yellow goes on my accent nail, and the peach (which is actually reddish) for the rest of my nails. I decided to use the matte finish for the accent nail, and glossy for the rest. 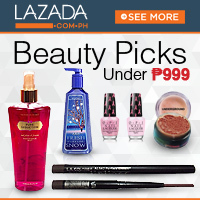 I of course used OMG Matte Potion for the matte finish, Caronia Fast-Dry Top Coat for the glossy, and Caronia Nail Hardener for the base. I apologize for the diffused light. I took these pictures in the early morning, and for some reason they came out like these. I even took a picture closer to the window, and it still came out washed. I do like how it came out though. It’s a very simple nail art that anyone can do, and it doesn’t require any additional tools apart from the polish bottles and their brushes. What do I think of my new polishes? The Sherbet Mango Yellow is a nice summer color, but one has to be very careful in the application, as it can make unsightly streaks if applied incorrectly. My right accent nail is unevenly done and I can see the layers. The Carolina Peach is really incorrectly named, as it’s most definitely red. A dark red, in fact, which is very far away from being peach. It is on the borderline of my tolerance for dark polishes, but for now it’ll remain in my stash. 1 Response to "Nails: Finishes and accents"